Harriet Quimby was a famous American female aviator whose career as a pilot did not last long but was undeniably heroic. She was the first American lady to become a licensed pilot and the first woman to fly across the English Channel. She was also a movie screenwriter. Even though she died very young, Harriet played a key influence upon the role of women in aviation. Harriet Quimby was born in Arcadia, Michigan on May 1, 1875. Her parents, William and Ursula were wealthy and educated her in America. Her only sibling was her older sister Kittie, while there were others before them who did not survive childhood and died due to various diseases. During the early 1900s, Harriet and her family moved to San Francisco, California and in 1902, she took a position as a writer for the journal “Dramatic Review”. The following year she moved to New York City where she began writing for Leslie’s Illustrated Weekly and more than 250 of her articles were published over a span of nine years. Her articles ranged in scope from household tips (“Home and the Household”) to advice for women on ways to find employment, budget their income, live prudently on a modest income in a safe apartment and ways to repair their automobiles themselves. Quimby had always dreamed of becoming a journalist, but her plans changed after she attended the Belmont Park International Aviation Tournament on Long Island, New York in 1910. There she met Matilde Moisant and her brother John (a well-known American aviator and operator of a flight school at Mineola), who was mainly responsible for developing her interest in aviation. Along with her friend Matilde Moisant, Quimby learned to fly at a school in Hempstead, New York, becoming the first U.S. woman to earn a pilot’s certificate. She received license number 37 from the Aero Club of America after just 33 lessons. Moisant soon followed and became the nation’s second certified female pilot. Soon after Harriet received her pilot license, she joined the Moisant International Aviators, an exhibition team. 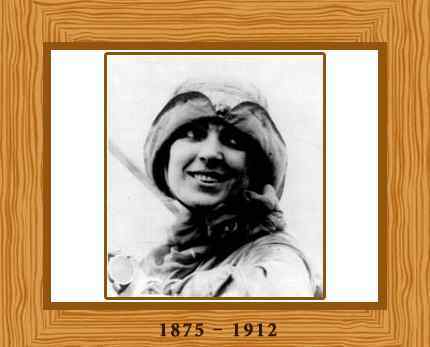 With the Moisant group she traveled to Mexico and became the first woman to fly over Mexico City. She found time in 1911 to write seven screenplays that were made into silent films. In 1912 Quimby borrowed a 50-horsepower Bleriot monoplane from Louis Bleriot and began preparations for an English Channel flight. Her consultant, Gustav Hamel, unsure of a woman’s ability to make such a flight, offered to dress in her purple flying suit and make the flight for her. She refused and on April 16, 1912 flew from Dover, England, to Hardelot, France (about 25 miles south of Calais). She flew the 22 miles across the Channel in one hour nine minutes. She would make quite a name for herself accomplishing this feat though it passed relatively unnoticed at the time by the press due to the sinking of the Titanic on the 14 April. She then returned successful, to America. Three months later, on July 1, 1912 Quimby made her last flight at the Harvard-Boston Aviation Meet where she met with a tragic accident. She was flying in the Bleriot with William Willard when suddenly the plane went into a nose dive. Willard was thrown from his seat after which the aircraft flipped over, throwing Harriet out too. Both Quimby and Willard fell and died at Dorchester Bay. Ironically the aircraft landed with little damage. Quimby died aged 37 years.